Some days require an adjustment of expectations. Today I woke at 10 am, which sounds more decadent than it was (I couldn’t sleep until 2 am). My Traveling Companion was hard to wake. I tried three or four times and gave up. I pretty much headed out of the hotel (having been quite frightened away from the trays of food set up for late breakfast in the bar) and just wandered down the street to get a café con leche. On my return, I still could not wake the Traveling Companion, so I settled in for a quiet day of Twitter. Finally, he woke, and we walked La Rambla to Old Town and back. Afterward, I negotiated some front desk help with a dinner reservation by giggling and pointing. Dinner is served from 8:30 pm onward. Many places serve food until 2 am. Lunch is 1 pm to 4 pm or something. Breakfast is a mystery. The Barcelona I have seen has none of the hysteria I found so common to Italy. Cars obey traffic lights. Pedestrians quietly glare at a taxi or truck that disobeys the signals. Crosswalks have lights which people mostly follow. There are bike lanes that are used by bikes and scooters and lots of parking in the middle of the street. The scooters park on the sidewalks, in great silent congregations; this is easy to understand since they are naturally herd animals of the plains. I see a lot of working people during the day, in suits, though mostly men. No drama in their discourse, just talking. Yesterday at lunch there was a group of three businessmen quietly working on a triangular-management-nonsense chart while they ate. They ordered dessert, too. One got a piece of fruit (was it apple? pear?) and it was served rolling around loose on a plate with a sharp knife and a fork. The manproceeded to eat it as if carving a tiny goose. I am frequently spoken to in Spanish or Catalan or French. They have a query that runs through the languages. I often reply with a “hi!” and we proceed in a version of English. Dinner has been under 50 euros the first two nights, despite ordering quite a lot of food. They charge your credit card for the amount on the ticket, and if something has occurred inspiring you to make a tip, you do it in cash. Wait staff leave you alone for long periods unless you attempt to engage them a lot, and sometimes will ignore us so ferociously we start to wonder about it. Last night we found a crêperie on the way to trying to find another restaurant. It was so small and inviting we stopped and went in. 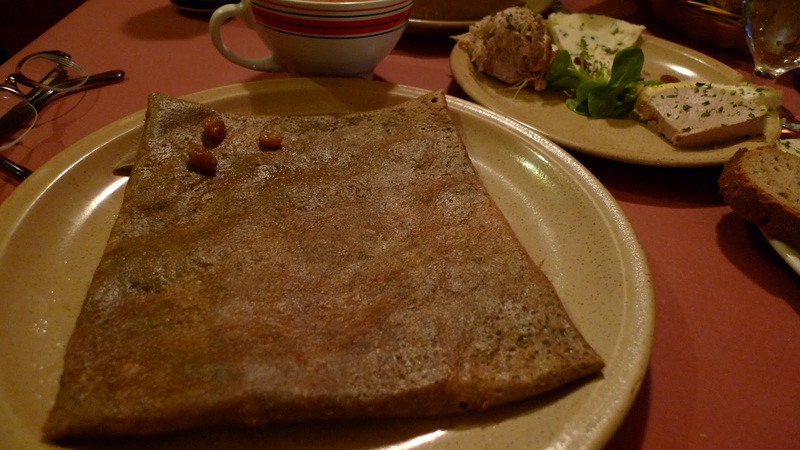 We had a cheese and meat plate and then galettes, which are traditional buckwheat crepes. The whole meal was pretty much fantastic. I had two glasses of cold French cider brut which was served to me in a tea cup. More delicious than anything I have had in a long time. They played French indie pop and rock on the stereo and had an amateurish mural of a dragon and an apple tree on the wall. I loved it. Tonight’s dinner was at an establishment recommended by a Fodor’s guide. I tend to be a minimalist as far as travel books go, preferring the firm opinions of one book over a stack of conflicting ideas. Nevertheless, a friend went to Spain last summer and put a pile of books in the mail to me, and I have been the better for it. First, I found a hotel which is both strange and pleasant and perfectly located yet near nothing and yet still near enough. Second, I can throw one of the glossy colorful books at my Traveling Companion and he can pretend to learn something just like I do. Anyway, I needed the help of the front desk to even make the reservation (Tonight? Tomorrow? I don’t care! What time? As early as possible. Ok, yes 8:30 pm.). It was close by, which was fine. It was well-lit, which was awkward. We were the second table to be seated (also awkward). Our menu was in English. The specials were in Catalan and Spanish. The food was local specialties, prepared with superlative skill. The wait for the check at the end of the meal will be even more memorable than the meal. Tomorrow, we’re thinking Japanese.